Rams are not indigenous to downtown Portland. This fact means it’s unlikely you’d see a horde of the horned animals sauntering down Congress Street. But stranger things have been seen in town, and on Sunday, rams will overtake the eastbound lane of Congress Street from the Maine College of Art (MECA) to the Eastern Prom during Ebune: Procession of the Ram. The annual parade, organized by Oscar O. Mokeme, director of the Museum of African Culture, draws inspiration from West African ritual traditions invoking the ram, or ebune, a symbol of fertility and the harbinger of spring renewal. And the rams in this parade are of the papier-mache variety, making them easier to handle and less likely to bolt into traffic. Different from other parades, where locals can do little but bystand as the stream of people and floats trickles by, Ebune invites everyone to join in the short trek to Portland’s East End. 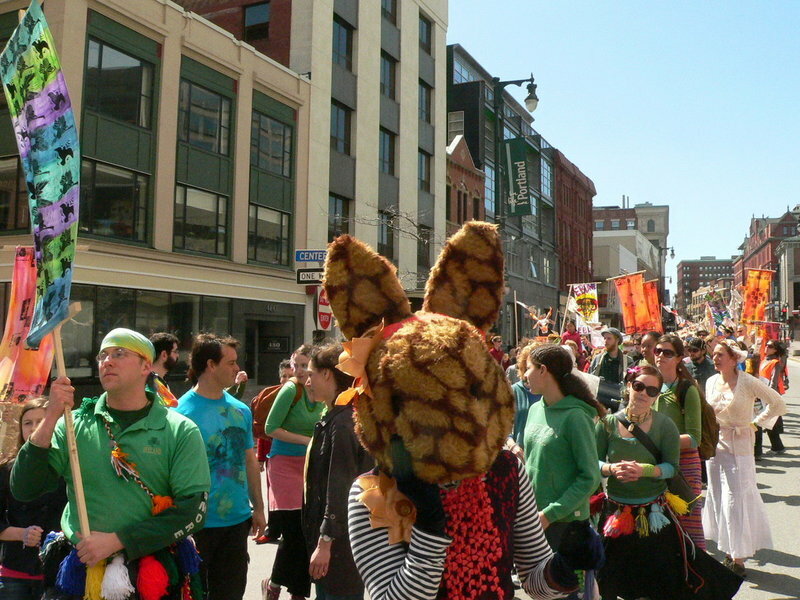 Parade goers will gather in front of MECA at 11:30 a.m., where the rhythmic sound of drumming will lure the parade-prepared and unsuspecting passersby. Extra ram puppets, Ebune flags and banners will be on hand for anyone who wants to join the festivities. Attendees can also create and bring their own masks, accoutrements and costumes. At noon, the parade will take to the street, marching to the Eastern Prom with plenty of drumming, dancing and (hopefully) spring sunshine. Festivities continue at the East End, where last year, local dancers performed on the grass and Mokeme donned an African mask to celebrate the season with a few ritual passes around the crowd. We’ve always heard that “spring comes in like a lion and goes out like a lamb.” No one ever mentioned the ram parade in the middle.